Formal testing is testing that must be done in a specific way, or to check specific facts. In the Rapid Software Testing methodology, we map the formality of testing on a continuum. Sometimes it’s important to do testing in a formal way, and sometimes it’s not so important. If you’re citing Sarbanes-Oxley compliance as a reason for producing test scripts, I worry that someone is beating you—or you’re beating yourself, perhaps—with a rumour. Sarbanes-Oxley says nothing about software testing. In fact, it says nothing about software. It does not say that you have to do software testing in any particular way. It certainly does not talk about test cases or test scripts. It does talk about testing, but only of “the auditor’s testing of the internal control structure and procedures of the issuer (of reports required by the SEC —MB)”. In this context, the word “testing” could easily be replaced by “scrutiny” or “evaluation” or “assessment”. Don’t believe me? Read it: https://www.sec.gov/about/laws/soa2002.pdf. Search for the words “test cases”, or “test scripts”, or even “test”. What do you find? Formality may provide a certain kind of value, but we must remain aware of its cost. Every moment that we spend on representing our test ideas as documentation, or on preparing to test in a specific way, or on encoding a testing activity, or on writing about something that we’ve done is a moment in which we’re not interacting directly with the product. More formality can be valuable if it’s helping us learn, or if it’s helping us structure our work, or if it helps us to tell the testing story—all such that the value of the activity meets its cost. The key question to ask, it seems to me, is “is it helping?” If it’s not helping, is it necessary?—and what is the basis of the claim that it’s necessary? Asking such questions helps to underscore that many things we “have to” do are not obligatory, but choices. Still other requirements are not well-understood before development begins; the actual requirements are discovered, revealed, and refined as we develop the product and our understanding of the problems that the product is intended to solve. As my colleague James Bach has said, “Requirements are ideas at the intersection between what we want, what we can have and how we might decide that we got it. In complex systems that requires testing. 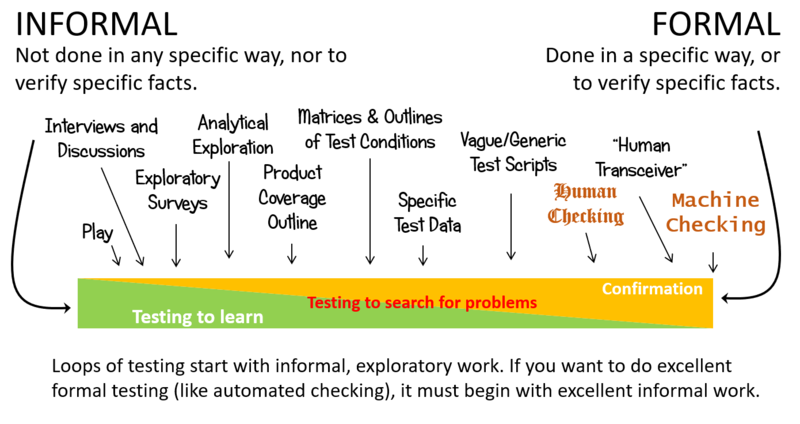 Testing is how we learn difficult things.” That learning happens in tangled loops of development, experimentation, investigation, and decision-making. Our ideas may or may not be documented formally—or at all—at any specific point in time. Indeed, some things are so important that we never document them; we have to know them. So it goes with testing. Some aspects of our testing will be clear from the outset of the project; other aspects of our testing will be discovered, invented, and refined as we develop and test the product. Excellent formal testing, as James says, must therefore rooted in excellent informal testing. And who agrees with that? The Food and Drug Administration, for one, in the Agency’s “Design Considerations for Pivotal Clinical Investigations for Medical Devices“. Few (in my experience, very few) of those people who insist on highly formal testing to comply with standards or regulations—or even with requirements documents—have read the relevant documents or examined them closely. In such cases, the justification for the formality is based on rumours and on going through the motions; the formality is premature, or excessively expensive, or unnecessary, or a distraction; and (in)consistency with the documentation and (non-)compliance with the regulations becomes accidental. At its worst, the testing falls into what James calls “pathetic compliance”, following “the rules” so we don’t “get in trouble”—a pre-school level of motivated behaviour. As responsible testers, it is our obligation to understand what we’re testing, why we’re testing it, and why we’re testing it in a particular way. If we’re responsible for testing to comply with a particular standard, we must learn that standard, and that means studying it, understanding it, and relating it to our product and to our testing work. That may sound like a lot of work, and often it is. Yet our choice is to do that work, or to run the risk of letting our testing be structured and dictated to us by a sock puppet. 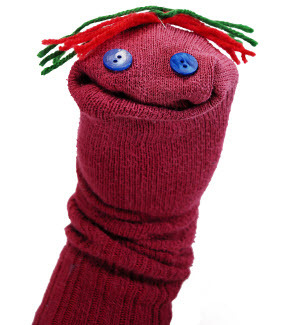 Or a SOX puppet.